Extensive Mercury MSDS plus common sources, best air purifier for Mercury, Hg test kits, and important health warnings are all on this page. Don't miss the fascinating video below of Mercury vapor wafting up off of a tooth filling and health consequences to you. Whether you are a dentist or dental assistant, a factory worker, or a concerned parent, there are many opportunities for exposure to mercury at home at work and at play, no matter who you are or where you are. From your old tooth fillings off-gasing "Quicksilver" fumes in your mouth, to fluorescent bulbs, old thermometers, your child's made in China toys, and even cans of tuna fish - this page will help you identify many other common sources, evaluate your past exposure, and limit the potential for Mercury poisoning. Though there are many possible sources of Mercury exposure in household items, according to the EPA, the most common way to be exposed in the U.S. is by eating fish or shellfish contaminated with Methyl-Mercury. We all have Mercury in our tissues as a result of eating fish and shellfish. But it is not just a problem in ocean shellfish or fish such as Albacore or Yellowfin tuna. Most people are oblivious to the problem of Mercury in local bodies of water. Just check EPA.gov to find out which of your local U.S. freshwater lakes and rivers are now impaired due to high levels of Mercury. Even rural areas are affected. Here where I live, in upstate South Carolina at the base of the Blue Ridge Mountains, it is like Water World. There are cold mountain streams, awe-inspiring waterfalls, and expansive deep lakes all around. It is a rural area far from the urban sprawl of Atlanta, GA and Greenville, SC. The wild and scenic Chattooga River is a few miles to the west, and beautiful lakes Jocassee, Keowee, and Hartwell are just a few miles to the east. These waters offer up a bounty of delicious freshwater fish like trout, bass, crappie, bream, and catfish. Unfortunately, almost all the waters here are now listed by the EPA as being impaired with Mercury, and some with additional man-made chemical pollutants like PCB. The problem is so bad the Corp of Engineers has posted fish consumption advisories at many boat ramps and eating ANY fish from some waters is considered a serious health hazard, especially for children and pregnant women. But how is all this Mercury getting into our waterways and the oceans? Some is a natural product of the Earth itself. For example, in the 350 foot cold depths of our Lake Jocassee, some Mercury in fish results from the soil and rocks the water covers and some falls from the sky in the form of rain carrying Mercury expelled from volcanoes around the world. But most Mercury in our SC lakes and rivers probably comes from man-made activities such as coal-fired power plants, landfill leachate, garbage incinerators, agricultural sludge, and waste water systems. In a 2002 study conducted by the National Association of Clean Water Agencies (NACWA) it was concluded that as much as 40% of all Mercury in U.S. wastewater systems likely came from dental offices which remove or use Mercury-containing amalgam for tooth fillings. This level of Mercury discharge into wastewater systems is much greater than all other Mercury sources combined. This is no surprise considering that in 2008 the EPA estimated that there were between 100,000 and 200,000 U.S. dentists in over 100,000 dental offices where dental amalgam fillings were being used or removed and resulting in almost 4 tons of Mercury being discharged into Publicly-Owned Treatment Works. According to the Interstate Mercury Education and Reduction Clearinghouse (IMERC), in 2004 over 30 tons of Mercury (almost 30% of all Mercury used in products) was sold as dental amalgam for use in dentistry. Dental amalgam, or “silver filling” as dentists sometimes call it, is usually made of nearly 50% liquid Mercury with the remainder being a powder of silver, zinc, copper, tin, and other metals. Mercury Video: "Smoking Teeth = Poison Gas"
Ask your dentist about the possibility of having older Amalgam fillings replaced with modern alternatives that may be safer, such as: gold alloys, resin ionomer, porcelain, glass ionomer, or resin composites. I'm sure he will reassure you of the safety of Amalgams or claim Mercury is no longer used. But I personally would not be so trusting. Mercury exposure in dental offices is a major health issue due to Mercury vapor from tooth fillings and amalgams. In fact, many studies have proven elevated levels of Mercury in blood and urine of most dental workers and reduced fertility in female dental employees. This is suspected to be related to elevated Mercury exposure at work. The use of high-speed drills and ultrasonic equipment also produces several potential health hazards such as aersolized tissue and fluid droplets with bacteria and viruses that are so tiny they can linger in the air and easily be inhaled. These dentistry activities also greatly facilitate the release of Mercury from old Amalgam fillings, especially when drilled or disturbed in any way. Other common inhalation hazards in dental practices are: particles of polishing or abrasion powders, plasticizing compounds, solvents, disinfectants, Formaldehyde, Alcohol, and other Volatile Organic Compounds. The IQAir Dental Pro Air Purifier has a 5-stage filtration system specifically designed to effectively filter out all the above common air pollutants found in most dental offices. Efficiently filters out Mercury vapor, tooth polishing particles, aerosolized tissue and fluid droplets, bacteria, viruses, combustion particles, odors, chemical disinfectant molecules, and most general dental office or household indoor air pollutants. The IQAir Dental Pro Air Purifier is a Top-Rated Best of Breed Air Purifier for Use in Dental Offices. Mercury, also known by the name Quicksilver, is a naturally occurring metal which has several forms. The metallic mercury is a shiny, silver-white, odorless liquid. If heated, it is a colorless, odorless gas. Mercury combines with other elements, such as chlorine, sulfur, or oxygen, to form inorganic mercury compounds or "salts," which are usually white powders or crystals. Mercury also combines with carbon to make organic mercury compounds. The most common one, methylmercury, is produced mainly by microscopic organisms in the water and soil. More mercury in the environment can increase the amounts of methylmercury that these small organisms make. Metallic mercury is used to produce chlorine gas and caustic soda, and is also used in thermometers, dental fillings, and batteries. Mercury salts are sometimes used in skin lightening creams and as antiseptic creams and ointments. RESTRICTED: Paint manufacturers agreed to discontinued the use of mercury in exterior paints after September 1991 and in interior paints after Aug 20, 1990. Inorganic mercury (metallic mercury and inorganic mercury compounds) enters the air from mining ore deposits, burning coal and waste, and from manufacturing plants. It enters the water or soil from natural deposits, disposal of wastes, and volcanic activity. Methylmercury may be formed in water and soil by small organisms called bacteria. Methylmercury builds up in the tissues of fish. Larger and older fish tend to have the highest levels of mercury. Eating fish or shellfish contaminated with methylmercury. Breathing vapors in air from spills, incinerators, and industries that burn mercury-containing fuels. Release of mercury from dental work and medical treatments. Breathing contaminated workplace air or skin contact during use in the workplace (dental, health services, chemical, and other industries that use mercury). Practicing rituals that include mercury. Elemental mercury vapor is toxic predominantly to the lung and central nervous system. Pneumonitis can result from exposure to high concentrations of mercury vapor not likely to occur in current industrial processes. Chronic exposure to inorganic mercury may produce proteinuria as evidence of kidney injury. Elemental mercury is combined with other metals without heating to form amalgams for dental fillings. Ammoniated mercury is a moderate skin sensitizer, and mercuric chloride is a strong sensitizer. The phenyl mercuric salts (used in herbicides, fungicides, antiseptics, and preservatives) are strong skin irritants. Organic mercury compounds are reproductive toxins that can cause CNS malformations and cerebral palsy in humans. There is limited positive data that inorganic mercury can cause spontaneous abortions in humans and birth defects in animals. Test the blood to detect methylmercury. Test the urine to detect elemental or inorganic mercury. Fish consumption is a fairly common cause of elevated blood mercury. Since organic mercury is usually excreted through the biliary system, urine levels are not useful. The Half-life of Mercury is the time required to reduce by one half the amount of Mercury absorbed by the body. Half-life can be calculated accurately only for those substances eliminated linearly, independent of concentration. For linearly eliminated substances, it takes approximately 3.5 half-lives to eliminate 90% of the substance. There are inadequate human cancer data available for all forms of mercury. Mercuric chloride has caused increases in several types of tumors in rats and mice, and methylmercury has caused kidney tumors in male mice. The EPA has determined that mercuric chloride and methylmercury are possible human carcinogens. Very young children are more sensitive to mercury than adults. Mercury in the mother's body passes to the fetus and may accumulate there. It can also can pass to a nursing infant through breast milk. However, the benefits of breast feeding may be greater than the possible adverse effects of mercury in breast milk. Mercury's harmful effects that may be passed from the mother to the fetus include brain damage, mental retardation, incoordination, blindness, seizures, and inability to speak. Children poisoned by mercury may develop problems of their nervous and digestive systems, and kidney damage. Carefully handle and dispose of products that contain mercury, such as thermometers or fluorescent light bulbs. Do not vacuum up spilled mercury, because it will vaporize and increase exposure. If a large amount of mercury has been spilled, contact your health department. Teach children not to play with shiny, silver liquids. Pregnant women and children should keep away from rooms where liquid mercury has been used. Learn about wildlife and fish advisories in your area from your public health or natural resources department. Tests are available to measure mercury levels in the body. Blood or urine samples are used to test for exposure to metallic mercury and to inorganic forms of mercury. Mercury in whole blood or in scalp hair is measured to determine exposure to methylmercury. Your doctor can take samples and send them to a testing laboratory. The EPA has set a limit of 2 parts of mercury per billion parts of drinking water (2 ppb). The Food and Drug Administration (FDA) has set a maximum permissible level of 1 part of methylmercury in a million parts of seafood (1 ppm). The Occupational Safety and Health Administration (OSHA) has set limits of 0.1 milligram of organic mercury per cubic meter of workplace air (0.1 mg/m³) and 0.05 mg/m³ of metallic mercury vapor for 8-hour shifts and 40-hour work weeks. Agency for Toxic Substances and Disease Registry (ATSDR). 1999. Managing Hazardous Materials Incidents. Volume III – Medical Management Guidelines for Acute Chemical Exposures: Mercury. Atlanta, GA: U.S. Department of Health and Human Services, Public Health Service. Also consider Northeast Waste Management Officials' Association (NEWMOA.org) who maintains a database listing not only the amounts of intentionally added mercury in consumer products, but also the purpose for which that Mercury was added and information about manufacturers of products that contain Mercury being sold in the eight states of Vermont, Rhode Island, Massachusetts, Maine, New Hampshire, Louisiana, Connecticut, and New York. Acute and chronic exposure to inorganic mercury can cause salivation with metallic taste, pain on chewing, gingevitis, colitis, stomatitis, kidney damage, and central nervous system damage. The latter can cause tremors, convulsive or shaking movements and psychic disturbances such as memory loss, insomnia, loss of confidence, irritability and depression. Excessive exposure may result in death. Skin and Appendages - dermatitis, other (after systemic exposure). Skin and Appendages - dermatitis, allergic (after systemic exposure). Skin and Appendages - sweating. Cardiac - pulse rate increase, without fall in BP. Peripheral Nerve and Sensation - paresthesis. Lungs, Thorax, or Respiration - pulmonary emboli. Kidney, Ureter, Bladder - other changes. Kidney, Ureter, Bladder - proteinuria. Biochemical - Enzyme inhibition, induction, or change in blood or tissue levels - other enzymes. Behavioral - alteration of operant conditioning. Sense Organs and Special Senses (Ear) - tinnitus. Nutritional and Gross Metabolic - body temperature increase. Liver - jaundice, other or unclassified. Reproductive - Paternal Effects - spermatogenesis. Reproductive - Specific Developmental Abnormalities - Central Nervous System. Reproductive - Paternal Effects - other effects on male. Tumorigenic - equivocal tumorigenic agent by RTECS criteria. Tumorigenic - tumors at site of application. This product contains mercury and is subject to the reporting requirements of section 313 of the Emergency Planning and Community Right to Know Act of 1986 and 40CFR372. This record contains information for mercury in its zero valence state only. For general toxicology and environmental fate of the mercury ions and inorganic mercury compounds, refer to the MERCURY COMPOUNDS record; for compound-specific information, refer to the appropriate individual records, e.g., mercuric oxide, mercurous oxide, etc. IDENTIFICATION: In its elemental form, mercury is a heavy silvery liquid at room temperature and has a very high vapour pressure. Mercury vapor is more soluble in plasma, whole blood, and hemoglobin than in distilled water, where it dissolves only slightly. The major natural sources of mercury are degassing of the earth's crust, emissions from volcanoes, and evaporation from natural bodies of water. (The world-wide mining of mercury is estimated to yield about 10,000 tons per year. The activities lead to some losses of mercury and direct discharges to the atmosphere). Other important sources are fossil fuel combustion, metal sulfide ore smelting, gold refining, cement production, refuse incineration, and industrial applications of metals. A major use of mercury is as a cathode in the electrolysis of sodium chloride. Mercury is used in the electrical industry, in control instruments in the home and industry, and in laboratory and medical instruments. A very large amount of mercury is used for the extraction of gold. Dental silver amalgam for tooth filling contains large amounts of mercury. Use of skin-lightening soap and creams can give rise to substantial mercury exposure. Occupational exposure to inorganic mercury has been investigated in chloralkali plants, mercury mines, thermometer factories, refineries, and in dental clinics. High mercury levels have been reported for all these occupational exposure situations, although levels vary according to work environment conditions. HUMAN EXPOSURE: The general population is primarily exposed to mercury through the diet and dental amalgam. Acute inhalation exposure to mercury vapor may be followed by chest pains, dyspnea, coughing, hemoptysis, and sometimes interstitial pneumonitis leading to death. (The ingestion of mercuric compounds, in particular mercuric chloride, has caused ulcerative gastroenteritis and acute tubular necrosis causing death from anuria where dialysis was not available). The central nervous system is the critical organ for mercury vapor exposure. Subacute exposure has given rise to psychotic reactions characterized by delerium, hallucinations, and suicidal tendency. Occupational exposure has resulted in erethism as the principal feature of a broad ranging functional disturbance. The kidney is the critical organ following the ingestion of inorganic divalent mercury salts. Occupational exposure to metallic mercury has long been associated with the development of proteinuria. Both metallic mercury vapor and mercury compounds have given rise to contact dermatitis. Mercurial pharmaceuticals have been responsible for Pink disease (acrodynia) in children, and mercury vapor exposure may be a cause of "Kawasaki" disease. Results of both human and animal studies indicate that about 80% of inhaled metallic mercury vapour is retained by the body, whereas liquid metallic mercury is poorly absorbed via the gastrointestinal tract. ANIMAL STUDIES: Evidence of damage to brain, kidney, heart, and lungs have been reported in rabbits exposed acutely to metallic mercury vapor at certain concentrations. Both reversible and irreversible toxic effects may be caused by mercury and its compounds. In two studies, tremor and behavioural effects were observed in rabbits and rats after several weeks of exposure to metallic mercury vapour. Depending upon the animal strain tested, either auto-immunity or immunosuppression is observed. The most sensitive adverse effect caused by mercuric mercury is the formation of mercuric-mercury-induced auto-immune glomerulonephritis. Mercuric chloride was found to induce gene mutations in mouse lymphoma cells and DNA damage in rat and mouse fibroblasts. The World Health Organization reported no evidence that inorganic mercury is carcinogenic. The neurotoxic effect seen after exposure to metallic mercury vapour is attributable to the divalent mercury ion formed through oxidation in the brain tissue. Significantly more mercury is transported to the brain of mice and monkeys after the inhalation of elemental mercury than after the intravenous injection of equivalent doses of the mercuric form. CLASSIFICATION: D; not classifiable as to human carcinogenicity. BASIS FOR CLASSIFICATION: Based on inadequate human and animal data. Epidemiologic studies failed to show a correlation between exposure to elemental mercury vapor and carcinogenicity; the findings in these studies were confounded by possible or known concurrent exposures to other chemicals, including human carcinogens, as well as lifestyle factors (e.g., smoking). Findings from genotoxicity tests are severely limited and provide equivocal evidence that mercury adversely affects the number or structure of chromosomes in human somatic cells. HUMAN CARCINOGENICITY DATA: Inadequate. ANIMAL CARCINOGENICITY DATA: Inadequate. Aneuploidy and other chromosomal aberrations have been observed in lymphocytes from whole blood cultures of workers occupationally exposed to mercury, including people working with mercury amalgams. Humans exposed occupationally to metallic mercury cmpd or Hg amalgams had significantly increased occurrence of lymphocytic aneuploidy but not structural chromosome aberrations relative to controls. The case of a 25 yr old woman with previous metallic mercury skin deposits treated by excision of the affected area and oral administration of 125 mg penicillamine 2 times/day, is reported. Symptoms of metallic mercury intoxication were not shown. Biopsy of the lumps produced a salmon pink fluid containing globules of metallic mercury. One yr after the incident no signs of long term intoxication were shown. CHRONIC ABSORPTION FROM HANDLING OF MERCURY OR EXPOSURE TO ITS VAPORS HAS LED TO A CHARACTERISTIC DISCOLORATION OF THE FRONT SURFACE OF THE LENS. ... ROSE-BROWN OR PINKISH HOMOGENEOUS REFLEX IS SEEN ... IN SOME CASES INVOLVING WHOLE ANTERIOR SURFACE ... SOMETIMES ... ANTERIOR SUBCAPSULAR DISC. Neonates have absorbed significant amounts of mercury after the breakage of elemental mercury switches in their incubators. 67 patients with oral lichen plantus of the atrophic-erosive or reticular plaque type were examined. Dental amalgam in contact with mucosal lesions was present in 64 patients, and gold fillings in 33. Patch testing with a standard procedure was performed with components of dental fillings. 11 patients (16%) reacted to at least one of the mercury compounds as compared to 8% in a reference group. Most positive reactions were caused by elemental mercury and ammoniated mercury. Increased metabolic rate increases ... food consumption and exposure to mercury through the food chain. AMONG INORG CMPD, ELEMENTAL MERCURY & DIVALENT MERCURY SALT ARE ... OF TOXICOLOGICAL INTEREST. IT IS DOUBTFUL WHETHER MERCUROUS MERCURY HAS ANY SURVIVAL IN THE ORGANISM, ALTHOUGH AT PRESENT POSSIBILITY ... THAT MERCUROUS MERCURY MAY BE INT IN REDOX TRANSFORMATION OF ELEMENTAL & MERCURIC MERCURY OR VICE VERSA IN BODY. AMONG INORG CMPD, ELEMENTAL MERCURY & DIVALENT MERCURY SALT ARE THE CMPD OF TOXICOLOGICAL INTEREST. IT IS DOUBTFUL WHETHER MERCUROUS MERCURY HAS ANY SURVIVAL IN THE ORGANISM, ALTHOUGH AT PRESENT POSSIBILITY ... THAT MERCUROUS MERCURY MAY BE INTERMEDIATE IN REDOX TRANSFORMATION OF ELEMENTAL & MERCURIC MERCURY OR VICE VERSA IN BODY. When 84 mercury exposed workers in a thermometer factory were compared to 79 workers not exposed to mercury, the exposed workers were found to have a higher prevalence of static tremor, abnormal Romberg test, and dysdiadochokinesia. There was a correlation between urinary mercury Hg and NAG suggestive of recent mercury toxicity, whereas the CNS signs and symptoms were considered a result of chronic toxicity. No differences existed between the groups of workers with regard to beta-microglobulin and retinol-binding protein, which are considered markers of proximal renal tubule function. Forty one male mercury exposed workers were examined for serum concentration levels of immunoglobulins (IgG, IgA, IgM), alpha-1-antitrypsin (AIAT), alpha-2-macroglobulin (A2M), ceruloplasmin (CPL), and orosomucoid (ORO). In the period preceding this investigation the mercury concentrations in workplace air ranged from 0.106 to 0.783 mg/cu m; the range of urinary mercury concentrations was from 0.029 to 0.545 mg/l. All but two (IgG and AIAT) of the immune parameters tested were at levels much higher than those found in a control group of 55 workers matched by age to the exposed workers and who lived in a relatively clean area. Almost 80% of the workers in the control group demonstrated no value out of the range of normal physiological limits, but only 36.6% of the exposed workers showed normal values. Liver Function Tests: Biochemical tests - Enzymes that reflect cholestasis: alkaline phosphatase (AP), 5'-nucleotidase (5'-NT) and leucine aminopeptidase (LAP); Enzymes that detect direct hepatic damage: aspartate aminotransferase (AST) and alanine aminotransferase (ALT). Clearance tests - indocyanine green, antipyrine test and serum bile acids. Complete Blood Count: Mercury has been shown to cause hematological changes, which can be assessed by performing a complete blood count. Respiratory Symptom Questionnaires: Questionnaires have been published by the American Thoracic Society and the British Medical Research Council. These questionnaires have been found to be useful in identification of people with chronic bronchitis, however certain pulmonary function tests such as FEV1 have been found to be better predictors of chronic airflow obstruction. Chest Radiography: This test is widely used for assessing pulmonary disease. Chest radiographs have been found to be useful for detection of early lung cancer in asymptomatic people, especially for detection of peripheral tumors such as adenocarcinomas. However, even though OSHA mandates this test for exposure to some toxicants such as asbestos, there are conflicting views on its efficacy in detection of pulmonary disease. Pulmonary Function Tests: The tests that have been found to be practical for population monitoring include: Spirometry and expiratory flow-volume curves; Determination of lung volumes; Diffusing capacity for carbon monoxide; Single-breath nitrogen washout; Inhalation challenge tests; Serial measurements of peak expiratory flow; Exercise testing. Sputum Cytology: Sputum cytology along with chest radiographs have been the standard procedures for detecting early lung cancer in asymptomatic patients. Sputum cytology has been found to be useful for detection of central tumors, especially squamous carcinomas. ONE OF MAJOR SOURCES OF ... EXPOSURE IS IN CHLOR-ALKALI PLANTS ... /OTHER SOURCES ARE/ MINING & REFINING OF MERCURY ... FROM PROCESSING OF CINNABAR (HGS) ... MFR & USE OF LIQ HG-CONTAINING INSTRUMENTS ... AN OFTEN UNREALIZED SOURCE OF EXPOSURE THROUGH BREAKAGE, SPILLAGE, OR CARELESS HANDLING. ... MOTHERS EXPOSED TO ELEMENTAL MERCURY THROUGH THEIR DENTAL WORK PLACE ... /SHOWED/ SIGNIFICANTLY INCREASED MERCURY CONTENT IN THEIR BABIES' PLACENTA & MEMBRANES. ... EXPOSURE LIMITS FOR WOMEN OF CHILDBEARING AGE & LEVELS AT WHICH TOXICITY MIGHT BE EXPECTED /HAVE BEEN SUGGESTED/. FOR FETUS & NEWBORN, THE TOXIC LEVEL IS GIVEN AS 3 UG HG/G. INHALATION OF VAPOR BY LABORATORY WORKERS IN CLOSED SPACE LED TO BRONCHIAL IRRITATION /& CHARACTERISTIC MERCURY POISONING SYMPTOMS/ ... CHRONIC MERCURIALISM IN FUR-CUTTING & FELT-HAT INDUSTRIES /IS REPORTED/. ALTHOUGH MERCURIC NITRATE WAS MATERIAL USED TO TREAT FUR FROM WHICH FELT WAS MADE, MERCURY WAS GRADUALLY RELEASED FROM FUR & FELT IN FORM OF METALLIC MERCURY VAPOR. ... THE WORKERS HAD MIXED EXPOSURE TO DUST OF MERCURY CMPD (ESP THE NITRATE) & TO VAPOR OF ELEMENT. ... POISONING WAS SIMILAR TO THAT OBSERVED ... /WITH/ METALLIC MERCURY ONLY. NIOSH, IN ITS CRITERIA DOCUMENT ... CONCLUDED THAT THE STD SHOULD BE AT LEAST AS LOW AS 0.05 MG/CU M ... /BECAUSE/ ERETHISM, RATHER THAN TREMOR, MAY BE THE MOST CHARACTERISTIC SYMPTOM OF CHRONIC MERCURIALISM /OCCURRING IN 33% OF WORKERS ABOVE 0.05 MG/CU M & IN 8% OF WORKERS BELOW THIS LEVEL/. ... /STUDIES OF WORKPLACES REVEAL/ THAT MUCH HIGHER EXPOSURES TO MERCURY VAPOR ... /OCCUR WHEN MEASURED/ BY PERSONAL SAMPLING DEVICES (0.016 TO 0.687 MG/CU M). THESE DIFFERENCES HAVE BEEN ATTRIBUTABLE TO MERCURY CONTAMINATION OF CLOTHING, WHICH MAY CAUSE SIGNIFICANT EXPOSURE AFTER WORK HOURS. Acute poisoning is major threat in home & on farm, but, because mercury is a cumulative poison, subacute & chronic intoxications are recognized, particularly in industry. Prior to 1991, phenylmercuric compounds were used as biocides in 25-30% of interior and exterior latex paint; however, this use of mercury was voluntarily discontinued for interior paint in 1990 and for exterior paint in 1991(1). The use of phenylmercury resulted in the exposure of house painters and residents to mercury vapors in the homes where interior and exterior latex paint was applied(1). Although the use of mercury biocides in latex paint has been discontinued, it is possible that people who use old latex paint in their homes will be exposed to mercury for a considerable time(1). Furthermore, although phenylmercury use in exterior latex paints was discontinued in 1991, paint companies were allowed to continue to produce and sell paint containing phenylmercury until the existing stocks of phenylmercury were exhausted(1). Assuming an ambient air level of 50 ng/cu m, the average daily intake of metallic mercury vapor would amount to 1 ug/day due to inhalation. ... The average daily intake of those sub-groups of the general population living in specially polluted areas is difficult to estimate with any accuracy. ... Daily intake from occupational exposure is almost impossible to estimate because of the wide variation in exposure conditions in industry. DROPLET OF MERCURY METAL INJECTED INTO ANTERIOR CHAMBER OF RABBIT OR INTO CORNEAL STROMA CAUSES PURULENT REACTION AROUND DROPLET, FORMING ABSCESS IN ADJACENT CORNEA, LEADING ULTIMATELY TO EXPULSION OF FOREIGN MATERIAL. ... MERCURY METAL WAS INJECTED ... INTO VITREOUS HUMOR OF RABBITS, & PURULENT REACTION WITH SHRINKAGE OF VITREOUS, DETACHMENT OF RETINA, & SHRINKAGE & ATROPHY OF EYE WAS OBSERVED. ... /WHILE/ IN CONTACT WITH CONJUNCTIVA, METALLIC MERCURY PRODUCED NO CLINICAL SIGNS OF CONJUNCTIVITIS, HISTOLOGICALLY AN INFLAMMATORY REACTION HAS BEEN DEMONSTRABLE ... EXTERNAL CONTACT WITH MERCURY VAPOR HAS REPEATEDLY BEEN OBSERVED TO INDUCE CHARACTERISTIC DISCOLORATION OF CRYSTALLINE LENS (MERCURIALENTIS). Threshold of effect opercular rhythm on Micropterus salmoides (largemouth bass) 10 ug/l/21 days. The uptake of mercury (Hg) and toxic effect of the metal on some biochemical parameters in the plant Pistia stratiotes were studied. The uptake of Hg by the plants gradually increased with incr in concn of Hg in the culture medium. Max accumulation of Hg was noted within a day. Max removal (approx 90%) of Hg was < 20 ppm Hg. Accumulation of Hg in roots was approx 4 times higher than that in shoots. At 20 ppm, Hg promoted senescence of the plants by decreasing chlorophyll, protein, RNA, dry wt, and the activities of catalase and protease as well as increasing free amino acid content, peroxidase activity, and the ratio of acid to alkaline pyrophosphatase activity over control values. At Hg concn < 20 ppm, these constituents were least affected. Microscopically detectable changes have been seen in the organs of dogs, rabbits, and rats exposed to concn of elemental mercury vapor ranging from about 100 to 30,000 ug/m3 for different periods of time. Severe damage was noted in kidneys and brains at mercury levels in air of about 900 ug/m3 after an exposure period of about 12 wk. After exposure of dogs to 100 ug mercury/m3, for 7 hr/day, 5 days/wk over a period of 83 wk, no microscopically detectable effects were seen, and tests revealed no abnormalities in kidney function. ... Reported the effects of elemental mercury vapor exposure on pregnant Sprague-Dawley rats. The rats were exposed to elemental mercury vapor at concn of 100, 500, or 1000 ug/m3 during the entire gestational period (chronic exposure) or duing the period of organogenesis (days 10-15, acute exposure). ... Acute exposure to 500 ug/m3 resulted in an incr in the number of resoptions (5/41), and chronic exposure at this concn resulted in two fetuses (out of 84 that were examined) with cranial defects. ... Acute exposure at 1000 ug/m3 resulted in an incr in the rate of resorptions (8/71), and chronic exposure at this dose level produced a decr in maternal and fetal weights ... and an incr in the number of resorptions (7/28). The toxicity threshold of mercury on the growth of S obliquus is 0.02-0.05 mg/l. The min concn which induces a complete growth inhibition, is in the range of 1-2 mg/l. The length of the lag phase during growth depends on Hg content. Concn of 0.05-1 mg/l Hg caused inhibition of autospore formation and disturbance of the mode of autospore formation and development. Cellular abnormalities including increased cell size and cells with irregular shapes were observed. The degree of abnormalities and duration were directly related to Hg concn. There were no visible changes of morphol at 2 mg/l but a gradual depigmentation of the chloroplast was noted. Hg at 0.01-1 mg/l caused decreases in the photosynthetic activity to approx 20-80% of control values within 24 hr. At the end of expts (48 hr) photosynthesis was almost restored when treated with < 1 mg/l Hg. Thus, the growth inhibition is due to an inhibition of photosynthesis and autospore formation. ... ONE OF THE ... PATHWAYS, IF NOT THE ONLY PATHWAY, BY WHICH ELEMENTAL MERCURY (HG(0+)) IS ABSORBED ... /& CONVERTED IN VIVO/ IS BY ITS OXIDATION /IN ERYTHROCYTES/ TO HG(2+). ... STUDIES WITH ACATALASEMIC RED BLOOD CELLS (RBCS) /SHOW/ THAT CATALASE-HYDROGEN PEROXIDE SYSTEM PLAYS A DETERMINANT ROLE IN MERCURY UPTAKE THROUGH THIS CATALYTIC OXIDATION SYSTEM; HUMAN ACATALASEMIC RBCS HAD ONLY 1/100 TO 6/100 THE UPTAKE OF MERCURY VAPOR FOUND IN NORMAL RBCS WITH HYDROGEN PEROXIDE. The oxidation of metallic mercury vapor to divalent ionic mercury ... takes place very soon after absorption, but some elemental mercury remains dissolved in the blood long enough (a few min) for it to be carried to the blood-brain barrier and the placenta ... Recent in vitro studies on the oxidation of mercury by the blood ... indicate that because of the short transit time from the lung to the brain almost all the mercury vapor (97%) arrives at the brain unoxidized. Its lipid solubility and high diffusibility allow rapid transit across these barriers. Oxidation of the mercury vapor in brain and fetal tissues converts it to the ionic form, which is much less likely to cross the blood-brain and placental barriers. The biological half-life of mercury in fish is approx 2 to 3 yr. The whole body half-time of mercury in man is approximately 50 to 70 days. A rapid component in blood has a half-time of about three days, and a slower component has a half-time of about 30 days. A rapid component in the brain has a half-time of about 21 days. There is evidence of a much slower component in brain with a half-time on the order of several years. For pike, mercury (Hg) concn in muscle after 70-90 days were 1000-1500 times that in water. ... The half-life for elimination of Hg from contaminated pike placed in clean water was 65-70 days. UPTAKE OF MERCURY BY BRAIN AFTER IV INJECTION OF ELEMENTAL MERCURY WAS INVESTIGATED IN RAT, AFTER DEPLETION OF GLUTATHIONE OR INHIBITION OF GLUTATHIONE PEROXIDASE IN BRAIN TISSUE. WHEN GLUTATHIONE IN BRAIN WAS DEPLETED 76% BY INTRAVENTRICULAR INJECTION OF DIETHYLMALEATE, A 13% INCR IN MERCURY UPTAKE WAS OBSERVED. AFTER INTRAVENTRICULAR INJECTION OF IODOACETATE, ACTIVITY OF GLUTATHIONE PEROXIDASE IN BRAIN WAS INHIBITED 19% & CONTENT OF REDUCED GLUTATHIONE WAS DECR 20%. IN THESE ANIMALS MERCURY UPTAKE BY BRAIN INCR 66% RELATIVE TO CONTROLS. The neurotoxic effect seen after exposure to metallic mercury vapor is attributable to the divalent mercury ion formed through oxidation in the brain tissue. Interference with enzyme function by binding to sulfhydryl groups is one possible mechanism ... Transport through the cell membrane via the formation of carrier complexes /sodium and calcium channels/ would also be a possibility, although this has not been demonstrated. IT HAS BEEN FOUND ... THAT ETHANOL DEPRESSES CONVERSION OF INHALED ELEMENTAL MERCURY INTO IONIC FORM IN BLOOD. IN ADDN, ETHANOL ENHANCES PULMONARY EXHALATION OF ABSORBED MERCURY, WITH RESULTANT EFFECT OF SUPPRESSING LUNG RETENTION OF MERCURY TOGETHER WITH LOWERING BLOOD MERCURY CONTENT. ... Concn of NTA in surface waters had no interaction with barium, antimony, molybdenum, strontium, chromium, silver, tin, iron, lead, cadmium, copper, and mercury ... and not enough with nickel, zinc, manganese, cobalt, magnesium, and calcium ... to be of environmental concern. The oxidation of elemental mercury vapor in the body ... can be reduced considerably (to about 50% of normal values) by moderate amt of alcohol. In an in vivo study, the uptake of labelled mercury into human red cells was reduced by a factor of ten by ethanol, while there was an incr in liver mercury concn ... .
Mercury is recovered almost entirely from cinnabar (alpha-HgS), 86.2% Hg, although elemental mercury occurs in some ores. Joint FAO/WHO expert committee on Food Additives (1972) quotes the major source of mercury (Hg) as the natural degassing of the earth's crust ... in the range of 25,000-150,000 ton of Hg/yr. Mercury is released into the environment from volcanoes and hot springs. Cu, Fe, Zn and many other metals precipitate metallic Hg from neutral or slightly acid soln of mercury salts. In ... the mercury liberated from the working and smelting of ores of copper, gold, lead, silver and zinc which normally contain traces of mercury. ... The average emissions of mercury stack losses for USA cinnabar (HgS) roasting operations was 2-3%. ... Maximum ground-level concn of Hg for 12 USA coal-fired power plants were 0.035-6.9 ug/cu m.
Mercury (Hg) loss est from Canada fuel consumption and other Canadian sources: In 1974, approximately 12 ton Hg were discharged to the environment as a result of coal combustion. Approximately 90% was discharged to air as vapor, 9% was adsorbed onto fine particulate (controllable by particle-collecting devices) and approximately 1% remained in the bottom or grate ash. In general, industrial and domestic products, such as thermometers, batteries, and electrical switches which account for a significant loss of mercury to the environment, ultimately become solid waste in major urban areas. Anthropogenic sources of airborne mercury (Hg) may arise from the operation of metal smelters or cement manufacture. Water borne pollution may originate in sewage, metal refining operations, or most notably, from chloralkali plants. Twenty thousand tons of mercury are released into the environment each year by human activities such as combustion of fossil fuels and other industrial release. Concentrated local discharges associated with industrial activities and waste disposal. Diffuse discharges generally associated with combustion of fuels containing mercury impurities. Mercury is released in various chemical forms. ... INADEQUATE & IMPROPER DISPOSAL OF INDUSTRIAL MERCURY WASTES INCR MERCURY LEVELS IN WATER & ATMOSPHERE. ... MICROORGANISMS CONVERT ELEMENTAL MERCURY INTO METHYL MERCURY SALT (CH3HGCL) & DIMETHYL MERCURY, WHICH ... ESCAPE INTO THE ATMOSPHERE. MOST OF THESE REACTIONS TAKE PLACE IN SEDIMENTS OF RIVER & OCEAN BEDS. ... MAJOR SOURCE OF MERCURY CONTAMINATION IS DISPOSAL OF INDUSTRIAL MERCURY WASTES INTO WATER WHERE THE WASTES SETTLE AS SEDIMENT, ONLY TO BE RECYCLED INTO THE WATER & AIR. ENVIRONMENTAL ACCUMULATION: TWO CHARACTERISTICS, VOLATILITY & BIOTRANSFORMATION, MAKE HG SOMEWHAT UNIQUE AS ENVIRONMENTAL TOXICANT. ITS VOLATILITY ACCOUNTS FOR HIGH ATMOSPHERIC CONCN, 20 TO 200 UG/CU M NEAR AREAS CONTAINING HIGH SOIL LEVELS (10 PPM) AS COMPARED TO NORMAL ATMOSPHERIC CONCN OF 5 UG/CU M. ... GROUND WATER CONCN IN USA ... BELOW 1 PPB. METHYLMERCURY IS FORMED NATURALLY IN AQUATIC AND TERRESTRIAL ENVIRONMENTS FROM ELEMENTAL MERCURY. ... METHYLATION IS LIKELY TO OCCUR IN UPPER SEDIMENTARY LAYERS OF SEA OR LAKE BOTTOMS. ... Certain bacteria, particularly of the genus Pseudomonas, can convert divalent mercury into metallic mercury. Specimens (195) of higher fungi and their substrata collected in the mercury mining area of Amiata and around Siena (central Italy), were analyzed for their total mercury (Hg) content. Wood decomposers and many species of mycorrhizal fungi accumulated the metal at a very low rate; some mycorrhizal species and all the humus decomposers may accumulate up to 100 ug/g/l dry weight of Hg and in the least contaminated sites, up to 63 times as much Hg as the substratum. In mineralized areas, the concn factor rarely exceeded 1. The methylmercury content of 35 /specimens/ (almost all edible), ranged between 0.01 and 3.7 mug/g/l dry weight. Much of the mercury deposited on land, appears to revaporize within a day or two, at least in areas substantially heated by sunlight. Volatilization of mercury from land and lakes was estimated to enhance the atmosphere concn over continental land masses by a factor of 45. Volcanic exhalations: Soil air over mercury deposits 0-2000 ng/cu m.
Persons in charge of vessels or facilities are required to notify the National Response Center (NRC) immediately, when there is a release of this designated hazardous substance, in an amount equal to or greater than its reportable quantity of 1 lb or 0.454 kg. The toll free number of the NRC is (800) 424-8802; In the Washington D.C. metropolitan area (202) 426-2675. The rule for determining when notification is required is stated in 40 CFR 302.4 (section IV. D.3.b). U151; As stipulated in 40 CFR 261.33, when mercury, as a commercial chemical product or manufacturing chemical intermediate or an off-specification commercial chemical product or a manufacturing chemical intermediate, becomes a waste, it must be managed according to Federal and/or State hazardous waste regulations. Also defined as a hazardous waste is any residue, contaminated soil, water, or other debris resulting from the cleanup of a spill, into water or on dry land, of this waste. Generators of small quantities of this waste may qualify for partial exclusion from hazardous waste regulations (40 CFR 261.5). Listed as a hazardous air pollutant (HAP) generally known or suspected to cause serious health problems. The Clean Air Act, as amended in 1990, directs EPA to set standards requiring major sources to sharply reduce routine emissions of toxic pollutants. EPA is required to establish and phase in specific performance based standards for all air emission sources that emit one or more of the listed pollutants. Mercury is included on this list. The high mobility and tendency to dispersion exhibited by mercury, and the ease with which it forms alloys (amalga) with many laboratory and electrical contact metals, can cause severe corrosion problems in laboratories. Special precautions: Mercury can attack copper and copper alloy materials. Mercury salts, when heated with Na2CO3, yield metallic Hg and are reduced to metal by H2O2 in the presence of alkali hydroxide. Cu, Fe, Zn and many other metals precipitate metallic Hg from neutral or slightly acid soln of mercury salts. /GUIDE 172: GALLIUM AND MERCURY/ Health: Inhalation of vapors or contact with substance will result in contamination and potential harmful effects. Fire will produce irritating, corrosive and/or toxic gases. /GUIDE 172: GALLIUM AND MERCURY/ Fire or Explosion: Non-combustible, substance itself does not burn but may react upon heating to produce corrosive and/or toxic fumes. Runoff may pollute waterways. /GUIDE 172: GALLIUM AND MERCURY/ Public Safety: CALL Emergency Response Telephone Number ... . As an immediate precautionary measure, isolate spill or leak area for at least 50 meters (150 feet) in all directions. Stay upwind. Keep unauthorized personnel away. /GUIDE 172: GALLIUM AND MERCURY/ Protective Clothing: Wear positive pressure self-contained breathing apparatus (SCBA). Structural firefighters' protective clothing will only provide limited protection. /GUIDE 172: GALLIUM AND MERCURY/ Evacuation: Large spill: Consider initial downwind evacuation for at least 100 meters (330 feet). Fire: When any large container is involved in a fire, consider initial evacuation for 500 meters (1/3 mile) in all directions. /GUIDE 172: GALLIUM AND MERCURY/ Fire: Use extinguishing agent suitable for type of surrounding fire. Do not direct water at the heated metal. /GUIDE 172: GALLIUM AND MERCURY/ Spill or Leak: Do not touch or walk through spilled material. Do not touch damaged containers or spilled material unless wearing appropriate protective clothing. Stop leak if you can do it without risk. Prevent entry into waterways, sewers, basements or confined areas. Do not use steel or aluminum tools or equipment. Cover with earth, sand, or other non-combustible material followed with plastic sheet to minimize spreading or contact with rain. For mercury, use a mercury spill kit. Mercury spill areas may be subsequently treated with calcium sulphide/calcium sulfide or with sodium thiosulphate/sodium thiosulfate wash to neutralize any residual mercury. /GUIDE 172: GALLIUM AND MERCURY/ First Aid: Move victim to fresh air. Call 911 or emergency medical service. Give artificial respiration if victim is not breathing. Administer oxygen if breathing is difficult. Remove and isolate contaminated clothing and shoes. In case of contact with substance, immediately flush skin or eyes with running water for at least 20 minutes. Keep victim warm and quiet. Ensure that medical personnel are aware of the material(s) involved and take precautions to protect themselves. DANGEROUS WHEN HEATED, IT EMITS HIGHLY TOXIC FUMES. Ground mixtures of sodium carbide and mercury, aluminum, lead, or iron can react vigorously. A violent exothermic reaction or possible explosion occurs when mercury comes in contact with lithium and rubidium. CHLORINE DIOXIDE & LIQUID HG, WHEN MIXED, EXPLODE VIOLENTLY. Mercury undergoes hazardous reactions in the presence of heat and sparks or ignition. HG & AMMONIA CAN PRODUCE EXPLOSIVE CMPD. ... METHYL AZIDE IN PRESENCE OF HG WAS SHOWN TO BE POTENTIALLY EXPLOSIVE. Incompatible with boron diiodophosphide; ethylene oxide; metals; methyl azide; methylsilane, oxygen; oxidants; tetracarbonylnickel, oxygen. A mercury manometer used with ammonia became blocked by deposition of a grey-brown solid, which exploded during attempts to remove it mechanically or on heating. The solid appeared to be a dehydration product of Millon's base and was freely soluble in sodium thiosulfate solution. This method of cleaning is probably safer than others, but the use of mercury manometers with ammonia should be avoided as intrinsically unsafe. Although pure dry ammonia and mercury do not react even under pressure at 340 kbar and 200 deg C, the presence of traces of water leads to the formation of an explosive compound, which may explode during depressurization of the system. Explosions in mercury-ammonia systems had been reported previously. Presence of mercury in methyl azide markedly reduces the stability towards shock or electrical discharge. A mixture of the dry carbonyl and oxygen will explode on vigorous shaking with mercury (presumably catalysed by mercury or its oxide). Insoluble, explosive acetylide is formed with mercury. When thrown into mercury vapor, boron phosphodiiodide ignites at once. Flame forms with chlorine jet over mercury surface at 200 deg to 300 deg C.
Methyl azide in the presence of mercury was shown to be potentially explosive. Several bottles, containing mercury, broke and spilled their contents as a delivery truck carrying the chemicals entered the loading dock of a university. Mercury was spilled all over the flatbed (wooden) of the truck and some of it seeped through cracks and fell onto the concrete. As the mercury fell onto the concrete thousands of mercury beads were formed. Approximately 10 kg of mercury was spilled. Cleanup crews arrived at the site and immediately barricaded the area to prevent public access. The delivery truck was moved to a leveled area to reduce spillage and was later moved to a waste management facility for decontamination. The crews wore protective clothing and self-contained breathing apparatus as personal protection. Since the cleanup of mercury from the concrete was requiring more time than what was expected. The self-contained breathing apparatus /equipment/ were depleting rapidly and a central air supply (with appropriate hoses and suits) was used to continuously supply clean air to the cleanup personnel. The beads of mercury on the concrete were picked up using mercury spill kits and a mercury vacuum cleaner. The cleanup took approximately 15 hr to complete. No environmental effects of damage occurred from the spill. The following treatment processes have shown possible applicability for spill countermeasures: clarification/sedimentation >99% removal; clarification/ sedimentation with chemical addition: (alum) >62% removal, (alum, polymer) 88% removal, (lime) >96% removal, (BaCl2) 87% removal, and (polymer) 99% removal. In mining and primary metal recovery operations, it has been a standard practice to liberally dust mercury spills with flowers (microcrystalline) of sulfur or preferably calcium polysulfide, to encourage the formation of a surface coating of mercuric sulfide which would reduce the rate of Hg vapor loss during the period of cleanup. The chloralkali industry has long relied upon wet operation, that is maintaining a water flow over the concrete floors underlying the electrolytic mercury (Hg) cells to reduce Hg vapor loss in this way. Sumps in the underfloor drainage systems were used to collect Hg from spills which were flushed into them, but the design of these was not highly effective. To reduce Hg losses via this route, water use for this purpose is now kept to a minimum necessity and the sump discharge is either fed into the brine circuit or treated for Hg removal prior to discharge. A small aspirator-driven vacuum trap with a "mercury sweeper", an amalgamated copper roller operating in a small, tin-plate "dustpan" or "mercury scoop" is effective. This can be followed, if necessary, (and with an appropriate choice, for the surface on which the spill took place) by washes with dilute nitric acid (approx 1 M), concentrated sulfuric acid, or bleach washes, and then by clear water rinses. Precautions for the hospital use of mercury have been outlined together with cleanup and special procedures to control mercury (Hg) vapor. Among these, use of an emulsified oil containing calcium polysulfide, or of an organic sulfur cmpd in a proprietary mixture have been suggested after the bulk of the spill has been recovered by conventional means. Helpful post-cleanup procedures are the application of an impervious paint film to suppress volatilization, and in floor maintenance measures the use of a wax containing 3-5% flowers of sulfur. After the use of a vacuum trap to recover the bulk of the metal, a fine copperwire or plated carbon fiber brush is recommended as the optimum cleanup utensil, particularly when the spill occurs on metal surfaces susceptible to amalgamation. Generators of waste (equal to or greater than 100 kg/mo) containing this contaminant, EPA hazardous waste number D009, must conform with USEPA regulations in storage, transportation, treatment and disposal of waste. Generators of waste (equal to or greater than 100 kg/mo) containing this contaminant, EPA hazardous waste number U151, must conform with USEPA regulations in storage, transportation, treatment and disposal of waste. Mercury is a poor candidate for incineration. Mercury (Hg) bearing brine purification muds from Hg cell process in chlorine production or Hg bearing wastewater treatment sludges from the production of Hg sulfide pigment is a poor candidate for incineration. Chemical Treatability of Mercury; Concentration Process: Activated carbon; Chemical Classification: Metals; Scale of Study: Literature review; Type of Wastewater Used: Unknown; Results of Study: 80% reduction by PAC and Alum coagulation. Water: Health and Welfare Canada recommends 0.001 mg/l Hg as a maximum acceptable concn in water; Air: The Ontario limit for airborne environmental Hg is 5 ug/cu m.
Metallic mercury (quicksilver) has been employed in India to fumigate and protect grain in closed containers from ... insect infestation. Used as a neutron absorber in nuclear power plants. In 1998, refining of recylced mercury was dominated by three companies - Bethlehem Apparatus Col, Hellertown, PA, D.F.G. Mercury Corp., Evanston, IL, and Mercury Waste Solutions, Inc., Minneapolis, MN. Obtained by roasting cinnabar (mercuric sulfide). By heating cinnabar with lime and condensing the vapor. Found in Spain, Yugoslavia, Mexico, Canada, and Algeria. A number of studies have documented mercury's availability for purchase in many /religious supply stores known as/ botanicas. Mercury is used to attract luck, love, or money; to protect against evil; or speed the action of spells through a variety of recommended uses, including wearing as amulets, sprinkling on the floor, or adding to a candle or oil lamp. It is sometimes taken internally to treat gastrointestinal disorders, or added to detergent or cosmetic products. ... Its widespread availability in botanicas suggests that indoor mercury exposure may be a problem for some users and their families. Blue pill; blue mass. Contains 32-34% metallic mercury. The rest is honey, licorice, althea, glycerol, and some mercury oleate. Available in commercial, instrument, redistilled, technical, and triple distilled grades. USP mercury conforms to US Pharmacopeia specifications. Triple distilled mercury conforms to American Dental Association & National Formulary requirements and reagent grade conforms to the ACS specifications. Base metals and precious metals (gold, silver). Electrical products such as dry-cell batteries, fluorescent light bulbs, switches, and other control equipment account for 50% of mercury used. Mercury is also used in substantial quantities in electrolytic preparation of chlorine and caustic soda (chlor-alkali industry, mercury cell process; 25%), paint manufacture (12%), and dental preparations (3%). Lesser quantities are used in industrial catalyst manufacture (2%), pesticides manufacture (1%), general laboratory use (1%), and pharmaceuticals (0.1%). It was estimated that approximately 35% of the mercury consumed domestically was used in the manufacture of chlorine and caustic soda and 30% for electrical and electronic applications. The remaining 35% was used for applications such as measuring and control instruments and dental amalgams. Since late 1990, no domestic mine has produced mercury as its primary product. 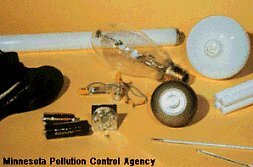 Nearly all the mercury produced in the United States was derived from secondary sources, including spent batteries, mercury vapor and fluorescent lamps, switches, dental amalgams, measuring devices, control instruments, and laboratory and electrolytic refining wastes. The secondary processors typically use high-temperature retorting to recover mercury from compounds and distillation to purify the contaminated liquid mercury metal. The secondary production of mercury in 1994, 1995, 1996, and 1997 was 466, 534, 446 and 389 metric tons, respectively. World production through mining operations in 1994, 1995, 1996, 1997, and 1998 was 1,960, 3,250, 2,580, 2,470, and 2,320 metric tons, respectively. U.S. import of mercury in 1994, 1995, 1996, 1997, and 1998 was 129, 377, 340, 164, and 128 metric tons, respectively. U.S. exports of mercury in 1994, 1995, 1996, 1997, and 1998 was 316, 179, 45, 134, and 63 metric tons. NIOSH Method 6009. Determination of Mercury by Cold Vapor Atomic Absorption (detection limit = 0.03 ug). The working range uses 0.01 to 0.5 mg/cu m for a 10 L air sample. The sorbent material irreversibly collects elemental mercury. A prefilter can be used to exclude particulate mercury species from the sample. U151; A toxic waste when a discarded commercial chemical product or manufacturing chemical intermediate or an off-specification commercial chemical product.